The HO Adjustable Rear Toe water ski binding now features the direct connect mounting system. The adjustable toe strap allows the user to tighten the binding to their desired comfort level. 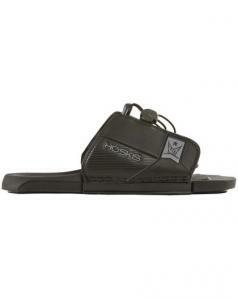 The open toe design allows for a wider range of foot sizes to fit in to the same binding. The direct connect mounting system to provide a more natural feel when turning the ski and while also greatly reducing the weight of the ski boot. Disclaimer: This 2017 product only mounts on a 2015+ HO waterski. If you are looking to buy the new 2017 HO boots for an older HO waterski (or a non-HO waterski), and color match it up to one of these new 2015 HO RTPs, you are in for a surprise. HO makes an adapter plate to mount your boot on a 2014 ski, but they did not make an adapter plate for this 2015 RTP. You will have to buy the Classic Black RTP (part of the HO Animal Binding line), or find an older 2014 RTP binding in stock, but a 2014 Rear Toe Plate bindings are becoming scarce because they dont make them anymore. Please see the related tab above to see the the HO Rear Toe Plate Water Ski Binding Classic Black which will mount on any HO ski 2014 or 2015.